For those counties part of ICORRS, which counties are still using conventional paging for Fire and/or EMS services? Armstrong - Fire was low band but shows deprecated. Are they using alpha pager or a different voice paging? EMS paging still 155.2200? Fayette - Fire dispatch still 155.1900? EMS dispatch still 155.2950? Indiana - Any Fire/EMS dispatch channels? Both showing deprecated. Alpha pager or another voice paging? Lawrence - Fire/EMS paging still on 153.9950 or just fire? EMS paging shows 154.8000? Somerset - Fire paging still lowband 33.7000? EMS paging still 155.1750? Westmoreland - Fire paging still 154.0400? EMS still 155.1600? Are any of these frequencies able to talk to county or just paging only? Do any of these counties have PD patch frequencies? Fayette is using the two frequencies you mentioned. Indiana is exclusively alphanumeric paging on 900 MHz. Westmoreland is using the two channels you mentioned. Somerset is paging on just 155.175 MHz for fire and EMS now. I don't know exactly what Armstrong and Lawrence are utilizing. In Somerset, 155.175 is no longer monitored by dispatch for voice transmissions, I can't answer that question for the other counties. Armstrong and Indiana uses a uhf freq for EMS / FIRE pocsag paging. Ok, so Armstrong and Indiana have no voice paging whatsover? Thank you, n3obl. I saw butler was tagged as a county on the system but didn&#8217;t see any TG info. Thank you. Butler county is in the process of moving off their current uhf, 470 NHS system. They will be going 800 mhz p25. They are moving off 470 due to the T-band take back from the FCC. Not sure when the system will be on line. Thank you. Do any of these counties have an out-of-county contact channel such as VLAW or UCALL or Med 4? 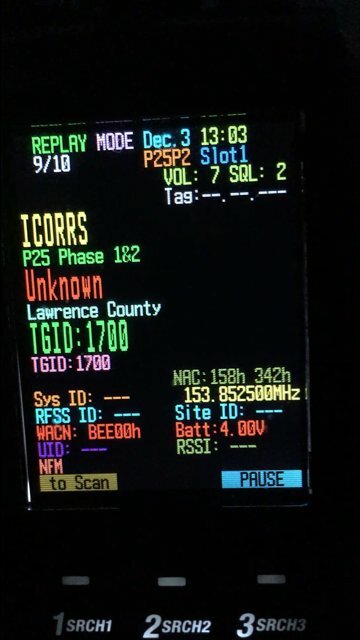 yes all ICORRS radios are supposed to get programmed with the IC wide area talk groups now there are so many radios in service prior to adding those talk groups that many are missing those. The 800 t/a channels are the same for every county. Which coincidentally they are the 800 nat interop channels in direct mode with no PL tone. Does county have access to these or are they just mobile off system frequencies? Fire 16 I Believe Not Can't Recall On EMS, Pd. That's Why The Tell You To Monitor Your CDM Channel In Westmoreland. Rumor has it, that when they do switch over, the PD channels are going to be encrypted. If you're referring to PD in Butler. I do know that radio will be able to be encrypted. Have not heard yet if the police channels will be encrypted or not. Nor have I picked up any activity for the new radio system yet. Herd April SystembStart up. Herd PD Encyrpt. I can verify when I get home, but Lawrence utilizes a few multigroups, and I believe that may be one of them. I looked through the talkgroups and they’re all in the 1500 range in Lawrence. I can't remember for sure, but I believe that there has been discussion in the past among the database administrators about excluding multigroups from the database listing since they are merely "virtual" talkgroups. If I am incorrect, though, and an admin would like me to submit the information to include these, I will gladly do so. But if you understand how the multigroups work, you will see that including them is redundant, IMHO.